Give it Away celebrates £1 million donated to Charity with a party! That is what makes Give It Away so special, and the care and friendship you all show me matters a great deal in my life” says Charlotte. 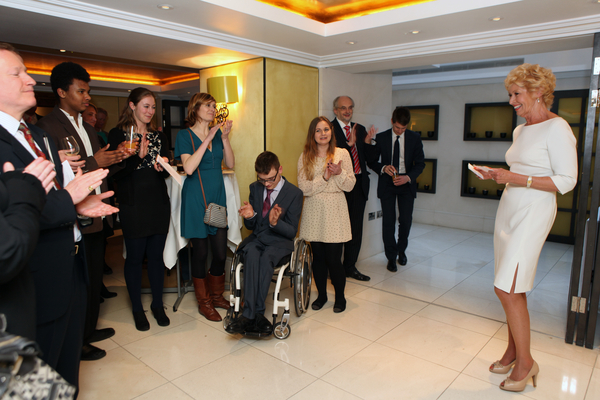 Give it Away Celebrates the £1million donated at the St. James Club! It’s finally arrived, the time to celebrate the £1 million give away from Give It Away Limited to various non-government supported charities, in only six years. At the St. James Club, everyone gathered in one room to celebrate this remarkable achievement, with profits earned via the property industry. All in one room were those have been helped on the frontline by the generous donations of Give It Away, and those who contribute behind the scenes to make everything possible. Charlotte gives heartfelt thanks to the lawyers who keep her out the court room, the accountants who make sure the cheques don’t bounce, the estate agents who sell and rent everything as fast as possible at the best price, and to the structural engineers who make sure the houses don’t fall down! She goes on to talk directly to “the charities that make her heart beat” and thanking them for keeping her inspired during all the months spent on muddy, cold building sites, for they remind her exactly why she is doing this. “The way that you all involve me and include me makes me feel like I have an extended family” says Charlotte. The aim of tonight was achieved with Genevieve from Ambitious About Autism taking the pictures, Wesley from Eikon handing out treats at the end, and George, chairman of the Whizz-Kidz board generously agreeing to help and advice Eikon with their own Youth Board. Also Luke from the Autism School who is successfully being sponsored on a personal training course has been offered a mentor in Andrew, Charlotte’s trainer and tenant. Working together is what Give It Away is all about. It’s not about putting large amounts of money into a melting pot, but continuing contact and support to see how the money is being spent and the benefits that it has on an individual’s life. “That is what makes Give It Away so special, and the care and friendship you all show me matters a great deal in my life” says Charlotte. * For more information regarding media usage, ownership and rights please contact Give It Away Ltd.